The Sweet Spot is what Karen calls those magic moments when you are riding around thinking: "Oh wow, this just feels amazing! It feels like my horse is doing it on his own and I am not doing anything!" Did you know that there is an actual process for creating these moments? You don't have to be a magician to feel the magic. There IS a way to spend less time searching and more time enjoying those yummy moments! 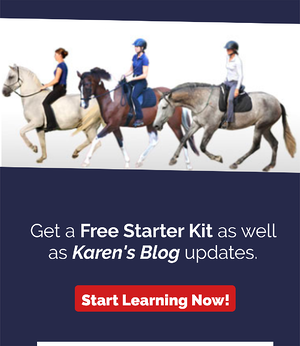 Karen's signature process, "Finding the Sweet Spot of Healthy Biomechanics", is the definitive combination of partnership-based principles with the art and science of Dressage. Learning to find the Sweet Spot of healthy biomechanics will change everything for you and your horse. Spend less time searching and struggling, and more time enjoying your horse's movement. Be able to enjoy maximum effort from your horse, without needing strong aids to sustain it. This method is covered in depth in the Dressage, Naturally book/DVD, and is the topic of many of the videos in the Dressage Naturally Video Classroom. If you want step-by-step guidance with a lot of support, the Finding The Sweet Spot of Healthy Biomechanics course in the Dressage Naturally Virtual Arena is where you will want to be. Helps your horse find the place where he tells you he feels balanced enough to let loose! Take the confusion out of straightness exercises. Find out how to get to a place where your horse is offering you the most, when you feel you are doing the least! Learn ways to do exercises in the saddle that will help you gain control over your own position. You will also learn to do any other position exercise with less stress and tightness! Learn the Dressage, Naturally concept of riding in connection. There is an emphasis on being curious and confident to trust your instincts in order to find the place where you and your horse can be enjoying! Your horse will melt in your hands and change the way he thinks about your touch! Understand how to use these categories to create strategic training plans for your specific horse. Never underestimate the potential for things to improve in ways you cannot yet imagine... Your next sweet spot may be closer than you think! Click HERE to see all the ways to start learning this method.